The fault-controlled Nibao Carlin-type gold deposit, together with the strata-bound Shuiyindong deposit, comprise a significant amount of the disseminated gold deposits in southwestern Guizhou Province, China. Five main types and two sub-types of pyrite at the Nibao deposit (Py1a/Py1b, Py2, Py3, Py4, Py5) were distinguished based on detailed mineralogical work. Py1, Py2 and Py3 are Au-poor, whereas Py4 and Py5 are Au-rich, corresponding to a sedimentary and hydrothermal origin, respectively. Through systematic in situ analyses of NanoSIMS sulfur isotopes, the framboid pyrite Py1a with negative δ34S values (− 53.3 to − 14.9‰) from the Nibao deposit were found to originate from bacterial sulfate reduction (BSR) processes in an open and sulfate-sufficient condition while the superheavy pyrite Py1b (73.7–114.8‰) is probably due to the potential influence of closed-system Rayleigh fractionation or the lack of preservation of deep-sea sediments. Data of Py2 and Py3 plot within the area of S isotope compositions from biogenic and abiogenic sulfate reduction. In view of few coeval magmatic rocks in the mining district, the near zero δ34S values of the Au-rich pyrites (Py4 and Py5) may discount the potential involvement of magmatic but metamorphic or sedimentary origin. LA-ICP-MS and TEM work show that Au in ore-related pyrite is present as both nanoparticles and structurally bound. 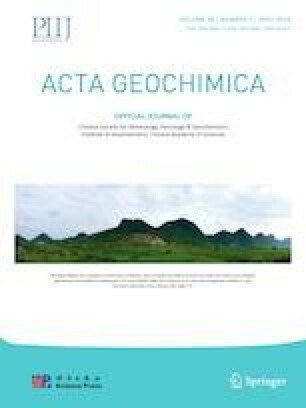 LA-ICP-MS analyses show that the Au-rich pyrite also contains higher As, Cu, Sb, Tl and S than other types of pyrite, which inferred a distal manifestation of deep hydrothermal mineralization systems. The online version of this article ( https://doi.org/10.1007/s11631-019-00342-0) contains supplementary material, which is available to authorized users. This study was funded by the National 973 Program of China (2014CB440906). We thank Guizhou Zijin Gold Mines for field work support. We are grateful to Ms. Dong Shaohua for SEM tests, Mr. Lin Peijun and Li Zengsheng for EPMA experiments, Mr. Zhang Jianchao and Mr. Hao Jialong for helping with NanoSIMS S isotope analyses, Mr. Gao Wei for helping with LA-ICP-MS analyses, Ms. Li Rui for FIB work and Dr. Liu Shirong for TEM tests, respectively. We acknowledge Dr. Wang Binbin and all the reviewers for their constructive reviews and considerate advices that led to great improvements of this paper.